Windows 8 is was clear only been just over a month on the market and from the beginning, that there will be not so many apps to the start of the new OS. Although the number of apps in Windows 8 Store has doubled within the last month, but still missing some important. This includes an official Facebook app. Facebook works on Windows 8 naturally perfectly in browsers, both desktop as well as under the "Metro UI". 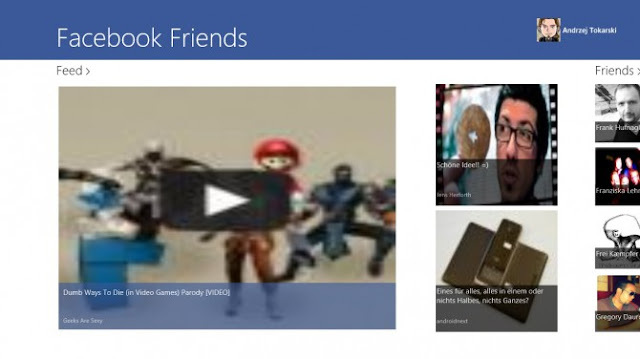 If you use Windows 8 on a tablet, however, Facebook is to use the browser is not always quite so comfortable, because the links are quite small simple. Optimized for touchscreen app is there but much more convenient. Place first the Top 5 Facebook Apps is My Social. 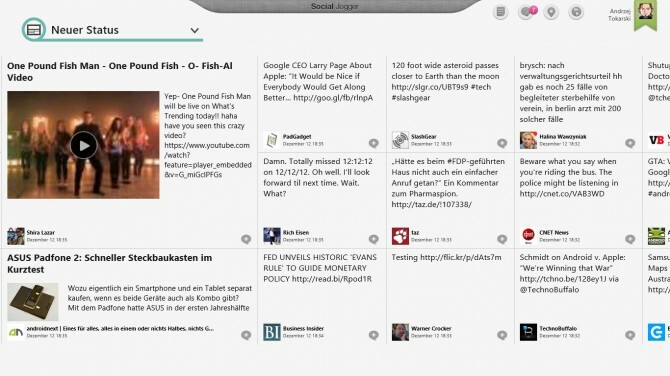 With My Social messages in both the News Feed, as well as friends and images are displayed in the typical Windows 8 tiles. You can also quite easily leaf through photo albums, both by their own, and those of friends. The most important feature of My Social is that links are opened directly involved in the app - automatically. Is not always the optimal solution to be shared by friends to view websites - with links to other apps, however, have their problems, asks me why not. 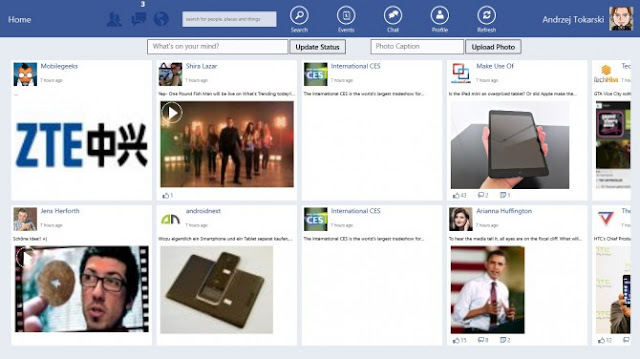 With the app "Facebook" it is not the official app from Marc Zuckerberg, even though the name suggests it does. The Facebook app is up to me to number 2, but has the potential to be the best app for the Sociale network. Also here are status messages in the typical tiles displayed and you can use almost all the features that are given on the website of Facebook. The big problem of this app is that you can not always click on the links that have been shared by friends or pages. Added a link in the status message included in a way that Facebook automatically generates a preview, then you get by clicking on the picture for the link. If the status but a normal link, without preview generated by Facebook, then this does not work. Facebook Friends recommend I can not, here are a number of functions would be added. Although the design is fine and is very reminiscent of My Social or "Facebook", but lacks some important features. One can not, for example, send messages to friends or received. Also, do not be left open here, they can not even copy them manually. The Facebook app is one of the most superfluous touch apps in Windows 8 Store. Here just the mobile website of Facebook opens in the app, only the top menu bar has received some larger buttons. 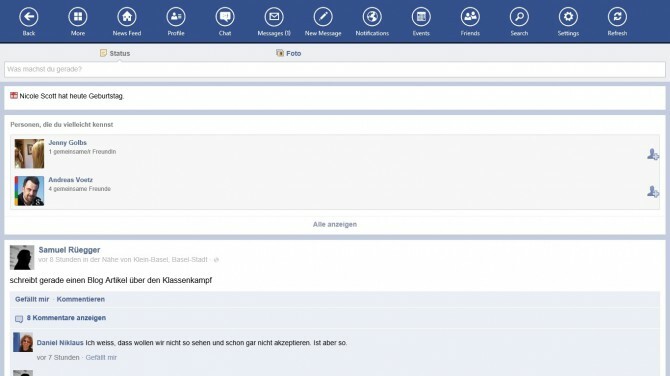 Facebook Touch you can save yourself and equal access m.facbook.com browser. Actually SocialJogger in my eyes is the best app for Facebook. It runs very smoothly, you have a quick overview of the different status messages of friends and pages and you can have really anywhere to click on links. Unfortunately, some missing for Facebook-specific functions, such as viewing photo albums of friends. For this you can integrate into SocialJogger other social networks, such as Twitter and YouTube. The problem is that Social Jogger comes from Acer and only works on devices by the manufacturer. Therefore I can not give SocialJogger the first place - for owners of Acer Tablets, such as the Acer Iconia Tab W510 , this app is a recommended method. 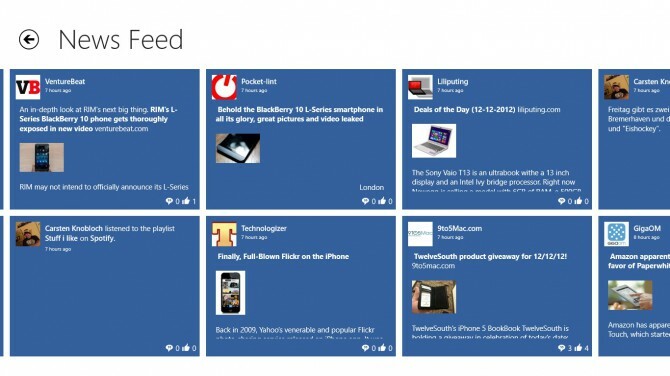 Have you already tried out Facebook apps in Windows 8? What do you like best?